! !PR-8 PENETRATING OIL Buy 2 Get 1 Free!! Buy 2 get one FREE! @ R60 each! INDY PR-8 Penetrating Oil is a multi-purpose lubricant designed with synthetic technology for use in household, automotive, marine and industrial applications. It penetrates deep into metals preventing rust and displacing moisture. It has a low surface tension which allows the product to spread quickly and penetrate tight crevices. 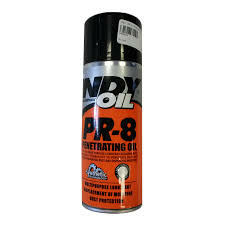 INDY PR-8 Penetrating Oil will loosen rusted parts. Protection of tools, door locks, etc. We’ve just launched our new site! Soon we will have an online shop to make ordering your filters and oil easy as 1-2-3! We will also be featuring Specials on Filter Kits! Based in Ballito on the North Coast, we are positioned to offer Quality Heavy Duty Filtration Products backed by Service and Technical know how.